AUDUSD is trending higher on its 1-hour chart as it formed higher lows and higher highs inside an ascending channel. Price is testing the 61.8% Fib that is close to the very bottom of the channel and might keep losses in check. The 100 SMA is still above the longer-term 200 SMA to indicate that the path of least resistance is to the upside. In other words, the climb is more likely to gain traction than to reverse. The 200 SMA also lines up with the bottom of the channel as the line in the sand for a correction. A break below this level could set off a reversal from the climb. 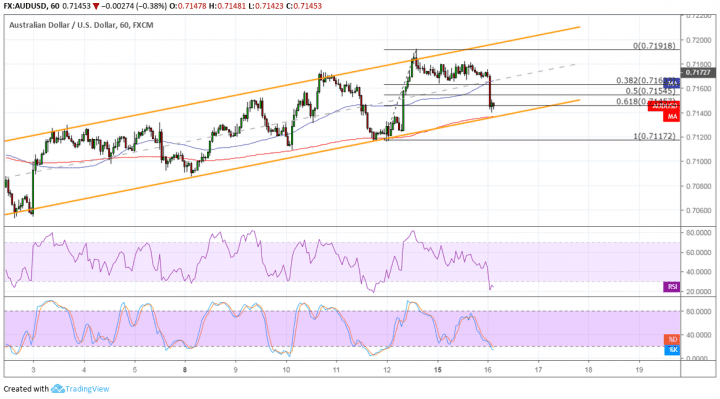 If the support area around the .7150 minor psychological mark is strong enough to spur a bounce, AUDUSD could recover to the swing high at .7200 or to the channel top closer to .7250. Stochastic is heading lower to suggest that there’s still some bearish pressure left but is also nearing the oversold region to reflect exhaustion. Turning back up could mean a return in bullish pressure. Similarly RSI has reached the oversold area to indicate exhaustion from the slide. Moving back up could signal that buyers are returning so price could follow suit. The RBA minutes revealed that policymakers are also open to the idea of cutting interest rates if inflation keeps slowing. However, they did cite that they’d also look at employment data for guidance. This should put more weight on the upcoming jobs release from Australia this week, as a stronger than expected report could ease rate cut concerns. On the other hand, disappointing results could mean more losses for the Aussie. The consensus is for a 15.2K increase in hiring, way above the earlier 4.6K rise. Meanwhile, the US has its retail sales figures to look out for ahead of the long weekend, possibly setting the tone for Fed policy expectations as well.